CBSE Class 10 Result 2019: The officials of Central Board of Secondary Education will release CBSE Class 10th Results on the official website of cbse.nic.in. The CBSE Class 10 Result 2019 Release date is expected in the last week of May 2019. Students who have appeared for the CBSE Class 10 board exam can visit the official website of cbse.nic.in to check their Class 10 CBSE Results in 2019. In order to check their CBSE Class 10 Result 2019, candidates must have their registration number & D.O.B which is as mentioned in CBSE Class 10 hall ticket 2019. In this article, we will provide you with all the necessary information regarding CBSE Class 10 Result 2019. Read on to find out CBSE 10th Class Result 2019. How To Check CBSE Class 10 Result 2019? Step 1: Visit the official website: cbse.nic.in. Step 3: The page will be directed. Step 4: Now look into the “News & Events” box which is displayed on the right side of the screen. Step 5: Click on the link CBSE Class 10 Result. Step 6: Now enter your Registration Number & D.O.B. Step 9: Now download your CBSE Class 10 Results safely for future reference. Students can check their CBSE 10th result via SMS too (charged at 50p per SMS). 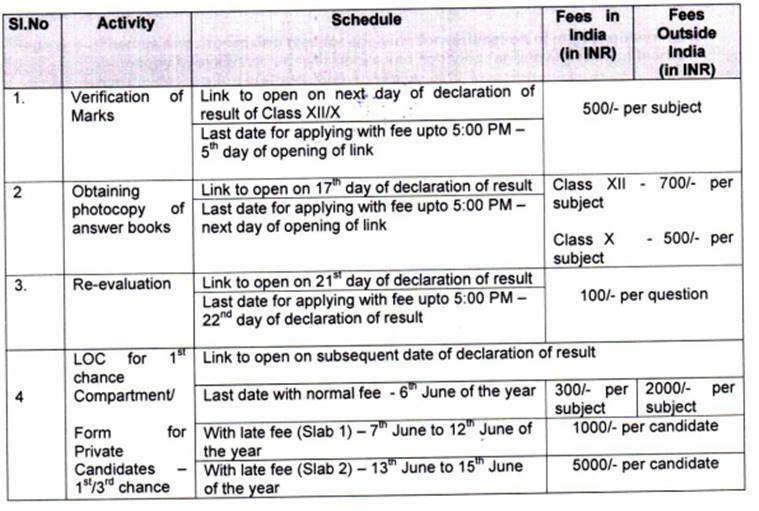 Type ‘CBSE 10 [roll no]’ and send it any of the following listed service providers. Candidates can visit the official websites – www.cbseresults.nic.in and cbse.nic.in to check your results. Students can register to get DigiLocker account by providing the mobile number. The account details of the DigiLocker will be sent to students via SMS on their mobile number registered with CBSE. How to apply for grade verification & obtain a photocopy of your answer book? If a candidate is not satisfied with their class 10 results then they have the provision to apply for re-evaluation of their answer sheets. Students who need to verify their marks can do so by making a payment of Rs 500 per subject. The links for CBSE Class 10 Result will be activated day after the declaration of the result on the official website, cbse.nic.in. Candidates can also obtain a photocopy of their board exam answer booklet by Rs 550 for class 10 exams, per subject. For re-evaluation purposes, the link will only be activated for one day. Students will have to pay Rs 100 per question for the re-evaluation process. Candidates must pay Fee of Rs.500/- per subject through payment gateway (Credit/Debit card) or through e-challan. Candidates cannot process the fee payment through offline mode. If the candidate is paying through offline mode then they have a facility to pay through DD. Only those candidates who have applied for the verification of grades will be able to get their photocopy of evaluated answer books. If candidates come across any mistakes in their answer book then they must write a formal letter will also be sent by speed post. If any of the answers are not evaluated, then candidates must report to their respective Regional Offices of CBSE not later than seven days of receipt with the photocopy of the answer book. CBSE Class 10 Result – How to calculate your CGPA? So, your CGPA is 8.4. The CBSE Class 10 Result Previous years analysis are given below. Now that you are provided all the necessary information regarding CBSE Class 10 Result 2019. If you have any query regarding CBSE 10th Class Results 2019, leave your comments in the comment section below and we will get back to you as soon as possible.